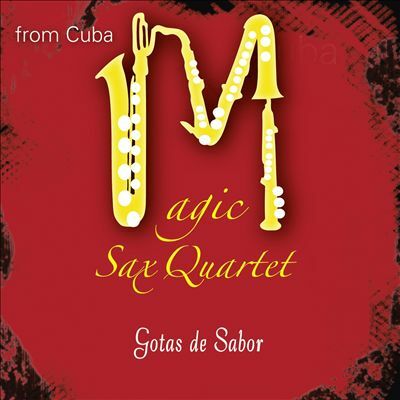 North American listeners could be forgiven if they assumed that a group with a name like Magic Sax might be an "easy listening" group, but Juan Chacon's quartet, also known as the Cuarteto de Saxofones de Santiago, is Santiago's answer to the more famous (outside of Cuba) Habana Sax group. In both groups, the saxophones are responsible for both the melody and the rhythm, and both use arrangements that are totally effective for this purpose. The Cuarteto de Saxofones de Santiago was founded on July 4, 1995, and the group is a key part of Santiago's small but impressive (and growing) Jazz scene. Gotas de Sabor, which was nominated for a Cubadisco (Instrumental Music) in 2014, is a beautiful combination of Cuban dance music, Jazz and elements of chamber music as it would be rendered by saxophones. Here is a nice video of the Magic Sax Quartet in concert in the iris Jazz Club in Santiago in 2013 (this is not a video from the album, but it captures their sound very well). The CD, of course, has much cleaner audio and includes several interesting guest artists, among others Ivan Acosta, who also contributes a few of the compositions, and Germán Velazco and Alfred Thompson with saxophone solos. Recommended listening, doubly so if you love saxophones. Triply so for fans of Habana Sax. There are some differences, but if you like the one, you will love the other.